Meh! I can't fall asleep I tried laying down since 12:30 this morning and finally decided to just get up and work, not to mention I have a huge headache which I think it is time to get a new pillow. Right now I am working on a new mermaid piece which I don't have a name for it yet but of course Shark Week helped me out on this piece though hehehe. This piece features Australian Ghost Sharks that I have never heard of till this week and they are the cutest things ever. I think these guys are in my list of favorite sharks. Here is a sketch of the image, of course it needs a lot of work but that is why I draw first then I do digital to get all the kinks out. Don't ask what the heck happened to her hands lol and of course this could change between now and when I am done with the outline. 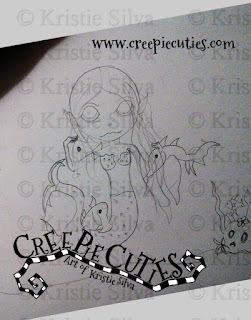 I have no clue what I'm going to be doing in the background yet hence the reason why I put a skull there and seaweed. I will eventually come up with something.